Editor’s note: Please keep comments kid-friendly. Ever since my mom wore her The Little Prince t-shirt and I blew her mind by saying I have never actually read it, I have been anxious to read this highly praised book. Now that I have, I think it was adorable and hard not to enjoy reading. The illustrations and author’s convincing and interesting point of view really caught my attention. This makes me even more excited to watch the movie and write another review about it (even if my mom refuses to watch it and ruin her favorite book ever, which I am sure many can relate to!). The beginning of the book was definitely what hooked me into its world and deep reading. 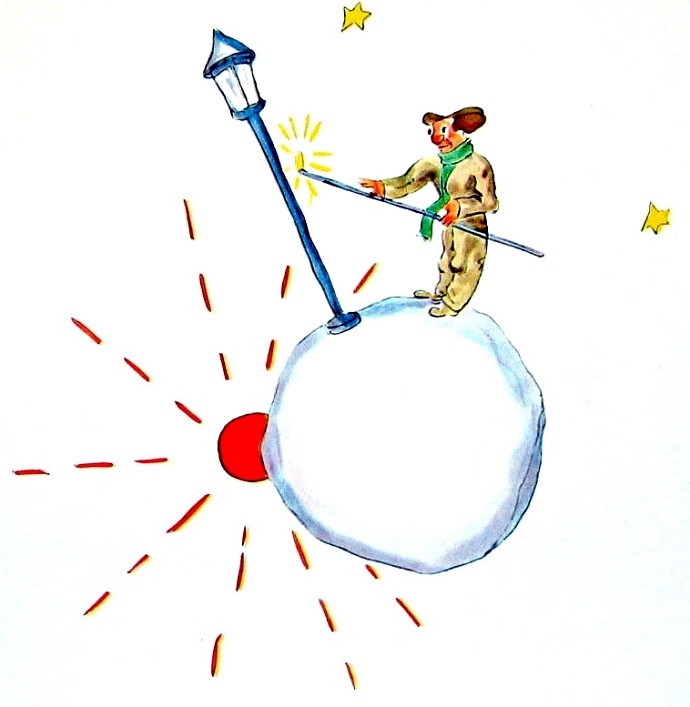 I absolutely LOVED how Antoine de Saint-Exupéry (that’s a mouthful!) started out his tale. I loved the way he began with his drawing of the boa constrictor swallowing an elephant, and how he explained the painful way the grown-ups would react, saying they couldn’t tell what he was drawing and he should give up drawing. It really proves that a child’s mind is very different from an adult’s, which we will get back to later .… This influenced his decision to become a pilot. When his plane crash-lands years later, the pilot is stranded in the desert far from France. This is where we meet that little ray of sunshine, the Little Prince. He asks if the pilot would draw him a sheep. The Little Prince has a rose on his home planet, Asteroid B-612. She is his heart and soul; his best friend; and the Little Prince wanted to protect her by putting the sheep in a muzzle. How could the pilot say no to his sweetness and innocence? The Little Prince makes me smile every time he is introduced. He is just, as I said earlier, a little ray of sunshine that looks for the good in everything. Not only this, but he is able to see what the grown-ups could not: the boa constrictor swallowing the elephant. How could you not love him? is the question I am sure everyone asks. 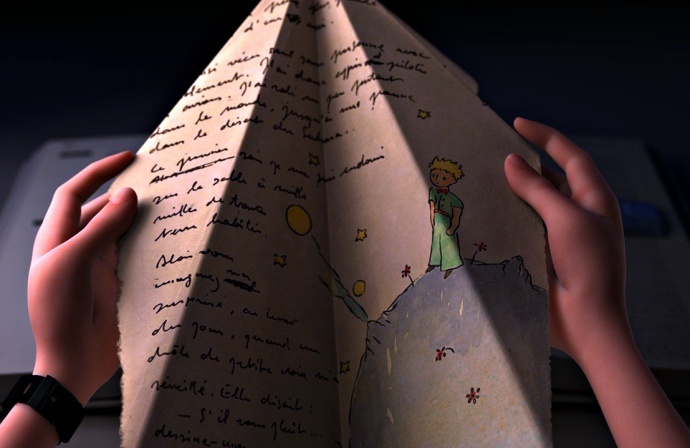 Then there are all of the Little Prince’s stories on how he managed to get to Earth and meet the pilot. Each of his stories is better than the next, on all of these other strange planets with kings who have no one to rule over, people who think they own the stars, and geographers who have no idea what the geography of their world is because they never go out to explore it. My personal favorite is the planet where the man must turn the street light on and off every minute because each minute was one day, and he was never able to sleep. The Little Prince’s stories were fascinating and I didn’t want to stop reading about them. Ask yourself, ‘Has the sheep eaten the flower or not?’ And then you’ll see how everything changes …. And no grown-up will ever understand how such a thing should be so important! It made me smile. After reading this book, I liked how the author places the most importance on the fact that what is invisible to the eye can be seen clearly through the heart. I think this means that certain emotions like love may not be able to be seen, but are always felt through the heart. In the book, the Little Prince said that there may have been thousands of roses in that rose garden, but you would never find what you were searching for in them. The Little Prince loved his rose, and that is what made her so special. I can’t wait to do a review on the movie! I hope it is as good as the book, but it will be hard to beat. 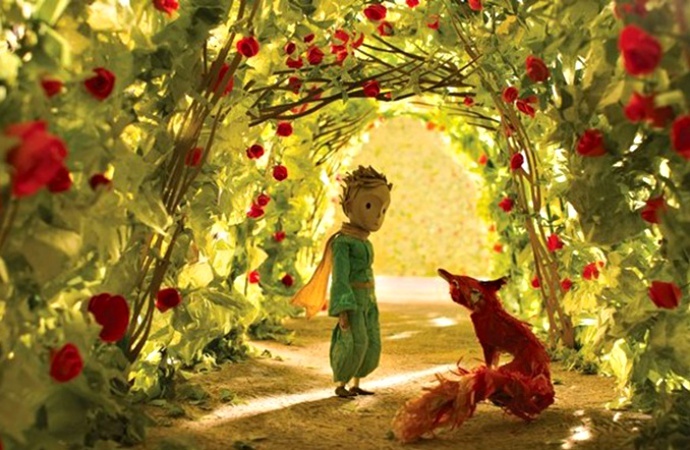 The Little Prince – The Movie: Watch It, Love It, Rewatch It! After reading the book, I took the time to watch the movie the next morning. My feelings? Awesome!!! I was worried it would be boring and I wouldn’t like it, but I ended up really loving it! Anyone who doubts this movie being amazing and adorable, please at least try it (even if I can’t convince my mother …)! There are a few differences between the book and the movie. It starts with a little girl (Mackenzie Foy), who was not in the book, but was a huge part of the movie. She has a mother (Rachel McAdams) who had the little girl’s entire life planned out on a board, and wanted her to grow up “perfectly.” Next door lives the pilot (Jeff Bridges), who, by this time, was an old man. The pilot is very sweet, and I always felt bad for him because he has a disastrous reputation. He is quite friendly to the neighbors, but they always run away when they see him. In Antoine de Saint-Exupéry’s book, the story is told from the author’s (the pilot’s) point of view, but the movie focuses mainly on the little girl, who also thinks the pilot is strange. The pilot sends the story of the Little Prince (Riley Osborne) to her on a paper airplane and, eventually, she and the pilot become friends. The other main difference is the ending: there is an add-on that is only in the movie. When the pilot decides he wants to be with the Little Prince, the little girl decides to go look for him to make sure the Little Prince will be there when he does. Don’t ask me how, but the little girl is somehow able to fly the plane into space where the Little Prince now lives. The Little Prince is grown up and has forgotten everything about his childhood, just like all the rest of the grown-ups. During this scene, I realized that maybe this add-on wasn’t a very good idea. I mean, it was cute and all, but the Little Prince is supposed to be the one who ALWAYS stays young in his mind and doesn’t forget, so I can understand if viewers don’t like this part. All the same, I still enjoyed it. Another thing I really love about this movie is the beautiful animation. 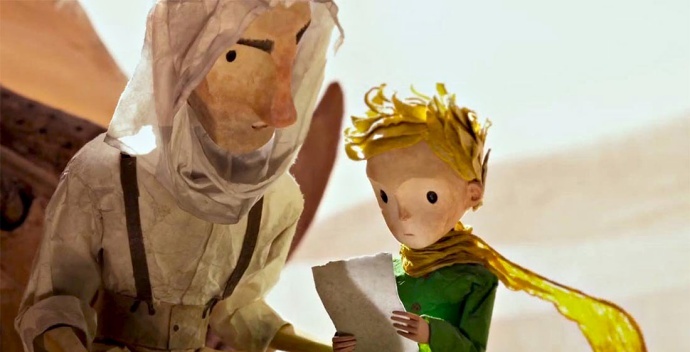 The overall movie is a 3-D cartoon, but, during the pilot’s memories and stories of the Little Prince, it looks like everything is made of paper, which is also really cool. The texture and depth the paper added make everything look even better than the 3-D animation. Toward the end of the movie, the little girl makes her mother realize that she is still a kid and that she should be able to have fun instead of going to upscale private schools and having her whole life planned out for her. The little girl tells the pilot the story of how she saved the Little Prince, and brought him back to his planet. The Little Prince is happy, even if his rose … (dun dun dun). This movie wasn’t perfect, but, I have to say, it was really good. I would be willing to watch it again and enjoy it just as I did the first time. It is on Netflix, which means you can watch it anytime! I really think you should give this movie a try if you are unsure. What’s the worst that could happen? (note from Mom: THE HORROR!) I give this movie four out of five stars. It may not be exactly the same as the book, but it is still adorable! Tags: Antoine de Saint-ExupéryBenicio Del ToroJames FrancoJeff BridgesMackenzie FoyMarion CotillardMark OsborneNetflixPaul GiamattiPaul RuddRachel McAdamsRicky GervaisRiley OsborneThe Little PrinceThe Little Prince movieWhat's the difference between The Little Prince movie and book?